Thank you Mitsuru for sharing your sister’s doll display with us and the song. I love the picture of you and your sister as children. Our Hina Matsuri Festival is this weekend in Arvada, Colorado. Today we celebrate Hina Matsuri, the girls festival. The dolls in the picture are from my parents home in Japan, we do the display of the dolls more or less a week before Hina Matsuri. We did the display of Hina Matsuri because of my sister. My grand father bought the dolls for her long time ago. It is said that the dolls protect girls from suffering diseases, bad luck and bring them happiness in future. There are several supersticions about this celebration, it is said that if you don´t put away the dolls after Hina Matsuri the girls will remain single extra time. My mum was very concerned about that! This week, I want to share some of the art prints available from Japanese artist Haruto Morita. 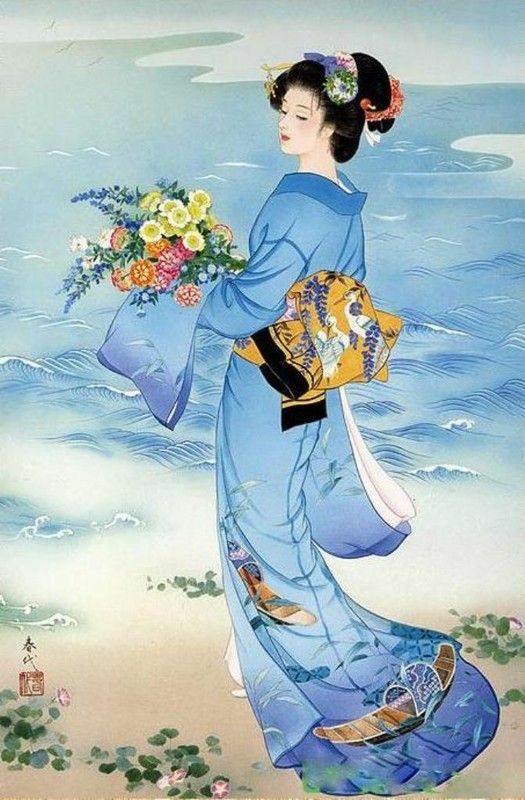 She creates beautiful images, many of which feature lovely Japanese women in kimono! She is originally from Kita-Katsushika County, Saitama Prefecture, Japan. Morita-san now lives in on the New South Wales coast at Korora, in Australia: “where the light and climate are perfect for her work.” (from her web bio page). Her web site is linked here. Please enjoy this small slide show of some of work. Better yet, visit her website and order a print! You can also purchase screensavers, jigsaw puzzles and other items derived from her art.